A blue whale, the largest animal on the planet, engulfs krill off the coast of California. Whales are the largest animals on the planet, but they haven’t always been giants. Fossil records show that ancient whales were much smaller than the currently living behemoths. So when did whales get so big, and how? A new study suggests it might be due to changes in climate that effected the food that some whales eat: krill and small fish. Instead of being spread throughout the ocean, lots of krill started being packed into a small area. Bigger whales were simply more efficient at eating the dense pockets of krill, and they beat out their smaller cousins. These whales use filters to feed on the tiny krill. 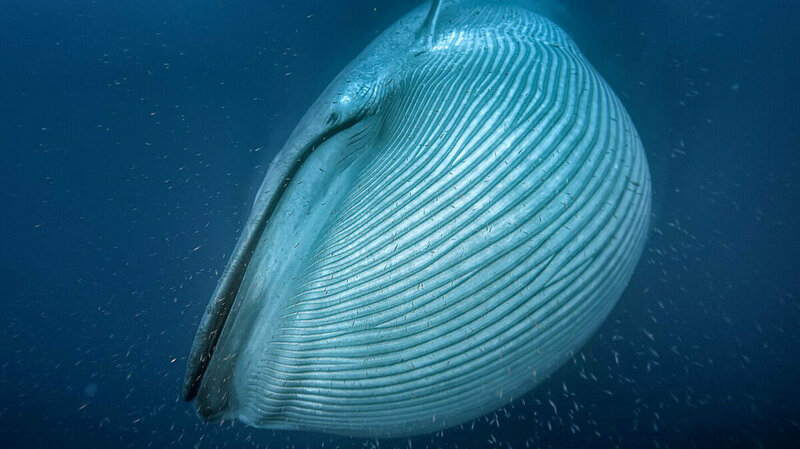 Known as baleens, they include the largest whale on Earth — the blue whale. The baleen filter looks like bristles of a comb and is made up of keratin — the same stuff in our fingernails. To eat, the whale opens its mouth and takes in a huge gulp of water. Then it spits the water back out, and food like krill are caught in the baleen filter. It’s a highly efficient way to eat, allowing whales to pack on the pounds. Goldbogen’s group looked back to see what was happening in the ancient oceans, and if there were any clues about what caused the massive growth spurt. They found that around the time baleens began growing larger, the ice ages started. The researchers think changes in climate led to increased runoff and more nutrients pouring into the coasts. At the same time, there was an increase in ocean upwelling, which occurs when wind pushes surface waters off-shore and causing deeper ocean waters underneath surface waters to replace it. Those deep waters are often full of nutrients and food for the whales. The combination of the ice ages and more upwelling resulted in dense patches of food in the ocean — setting the stage for massive whales to win out. During upwelling, wind-displaced surface waters are replaced by cold, nutrient-rich water that “wells up” from below. “As animals are getting bigger, they’re getting much more efficient. So for every gulp, they’re getting tremendous amounts of energy” Goldbogen says. Think about it this way: It takes a lot of energy for a giant whale to open its giant mouth. If a lot of food is packed into a small space, those whales can swallow it up in one big gulp and it’s worth all the energy it takes. But if the food is spread out and the whales have to swim around opening and closing their mouths a lot — then it’s not great to be a big ol’ whale. So big whales are more efficient at eating the dense patches of food, while smaller whales might be more suited to eating food dispersed throughout the ocean. The changes in the ocean also allowed to whales to get really big, really fast. The researchers reported in the journal Royal Society B on Tuesday, that the whales increased in body mass from 10 tons to 100 tons in just a few million years. 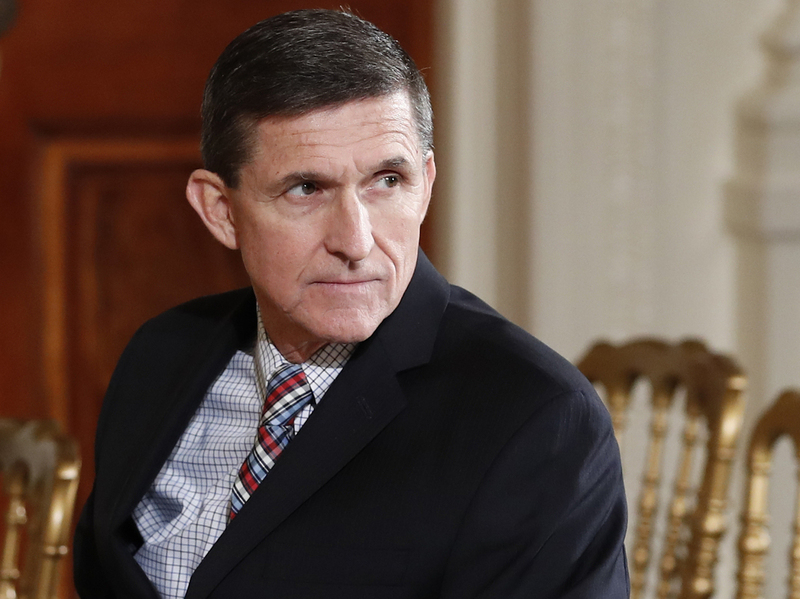 “While we disagree with Gen. Flynn’s lawyers’ interpretations of the taking the Fifth, it is even more clear that a business does not have a right to take a Fifth if it’s a corporation,” said Warner. But Burr disagreed and said the committee has sent a letter to Flynn’s lawyers questioning the legal basis for his refusal to cooperate with the request for documents. A remarkably complete fossil of a young child suggests that key elements of the human spinal structure were already in place in an ancient human relative 3.3 million years ago. The child, about three years old, likely died suddenly and quickly drifted into a body of water, where she was covered in sediment that eventually hardened to sandstone, Zeray Alemseged of the University of Chicago tells The Two-Way. His team found the well-preserved fossil in 2000 in Dikika, Ethiopia, and for years they have been painstakingly excavating it, revealing what they say is the only known backbone with completely preserved bones of the middle and upper back dated prior to 60,000 years ago. Their findings were recently published in the Proceedings of the National Academy of Science. The fossil is nicknamed Selam, which means “peace” in Ethiopian Amharic. She is from an early human relative species called Australopithecus afarensis. The famous Lucy fossil is also from this species. The full skeleton of Selam, including the spinal column. 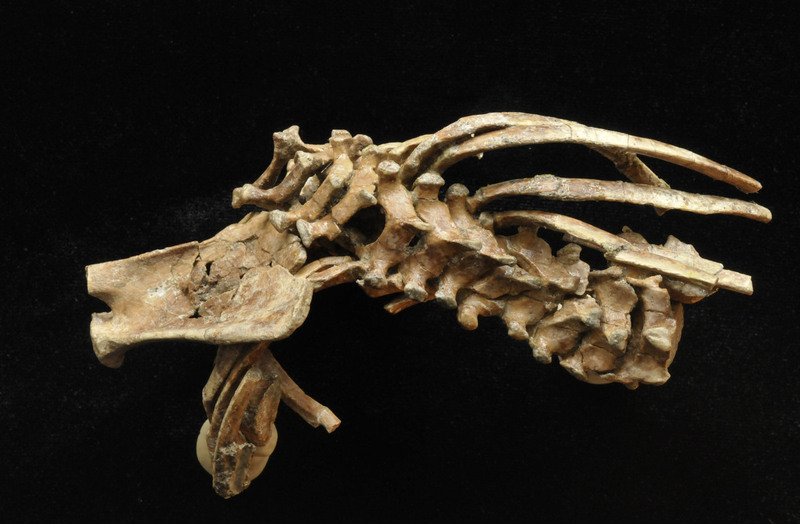 The spines of our early ancestors have been mysterious. They are not well preserved in the fossil record, Alemseged explains, because they are much more fragile than other parts of the animal, like teeth. The specimen has the same number of neck (seven) and mid-back vertebrae (12) as modern humans, while African apes have 13 mid-back vertebrae. It is well-established that this species walked upright on two legs (though there’s some debate about how much time they spent climbing). But this backbone sheds more light on how they moved. That’s because they “don’t seem to have the ability to rotate their backbone, even though they had the ability to extend and flex their backbone,” he says. Scientists spent 13 years working on the fossil at Ethiopia’s National Museum; it later traveled to Grenoble, France, for high-resolution imaging. He described the fossil found at Dikika as the “gift that keeps on giving,” because its completeness allows researchers to be quite sure about their conclusions. It’s high praise for research on ancient fossils, where findings are often highly controversial. Richard Potts, the director of Smithsonian’s Human Origins Program, echoed the sentiment, calling it an “excellent job of analysis and interpretation.” At the same time, he stressed that other, less-complete vertebrae, such as fossils found in Sterkfontein, South Africa, have previously suggested that a humanlike species more than 2 million years old had some of the same spinal features. 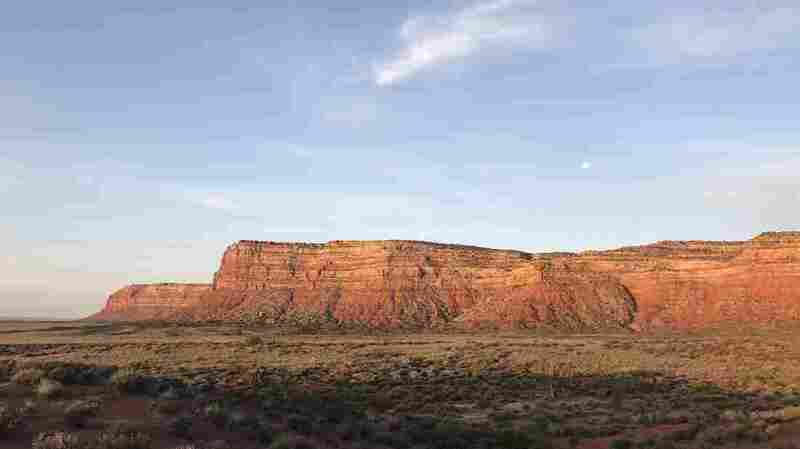 This Land Is … Cut Under Trump's Budget? Desert lands run by the U.S. Department of Interior in Utah. Rural communities dependent on U.S. public lands for everything from outdoor recreation to hunting to livestock grazing could be hit hard under the Trump administration’s latest budget proposal unveiled Tuesday. Still subject to approval by Congress, the president’s budget includes a roughly $1.4 billion cut to the Department of Interior and far deeper cuts to the Department of Agriculture: combined the two agencies own and manage more than 700 million acres of public lands, mostly in the West. Here are three items of note in the Department of Interior budget alone that aren’t generating much attention so far. But they could disproportionately hit rural communities, many of which tended to support President Trump in last year’s election. A proposed $12 million cut to rangeland management programs designed to rehabilitate grass and prairie lands important for cattle ranchers that depend on public lands for grazing. A $14 million cut to wildlife management programs, which has already come under scrutiny in western states like Colorado, where revenues from hunting and fishing on public lands have been falling. A proposed large cut to the popular Land and Water Conservation fund that’s added scores of private lands into the protected federal public land system since 1964. As a congressman representing Montana, Interior Secretary Ryan Zinke was a vocal supporter of the Land and Conservation fund. But at a budget briefing for reporters Tuesday he appeared to sound a different tune on future land acquisition and conservation more generally. “Rather than simply adding more land, we want to make sure we take care of what we have,” Zinke said. Like many of his predecessors, Secretary Zinke has articulated a broad, if sometimes complicated, vision for the future of public lands management. On the one hand, he’s pledged to be a conservation champion in the spirit of Teddy Roosevelt. But he’s also promised to boost the economies of rural American towns by increasing mining and other development on public lands that surround them. For sure, this reflects the often competing “multiple use” mission of DOI agencies such as the Bureau of Land Management. But Zinke predicted that reversing Obama-era policies restricting off-shore drilling alone could bring revenue back for many of the restoration and conservation programs currently facing cuts. Still, many influential sportsmen and public lands groups say the administration’s budget is directly at odds with many of the conservation values Mr. Zinke espouses. “When you talk about on the one hand, increasing access, and then you cut out the very tool to do that, it’s hard to reconcile,” said Land Tawney, executive director of Backcountry Hunters and Anglers. As much of the rural West in particular has been transitioning from a resource-based economy to one more dependent on outdoor recreation, groups like Tawney’s have flexed their political muscle recently. They say they plan to press Congress in the coming weeks as well, if the administration’s budget proposal moves forward. Meantime there is early and widespread speculation that much of the budget stands little chance of passing Congress, at least in its current form, even with the president’s party in control of both the House and the Senate. For his part Tuesday, Secretary Zinke seemed to view the latest budget proposal as a conversation starter, even if it’s controversial. He argued that many federal land agencies need to be overhauled and updated with a longer term vision. “I view this as a reorganization to look at how best to manage, protect and use our public lands in the next 100 years, given that we have a number of challenges,” Zinke said. US Republican Presidential Candidate Donald Trump holds two babies after his Town Hall address at the Gallogly Events Center in Colorado Springs, Colorado, on July 29, 2016. When the Trump administration previewed its budget last March, it called it the “hard power” budget. The latest details show that it greatly increases spending on defense, veterans and homeland security, and slashes funding for major social safety net programs such as Medicaid and SNAP (also known as food stamps). Yet amid all that, the budget introduces a new entitlement: six weeks of paid parental leave. And that program could end up requiring states to raise their unemployment taxes. 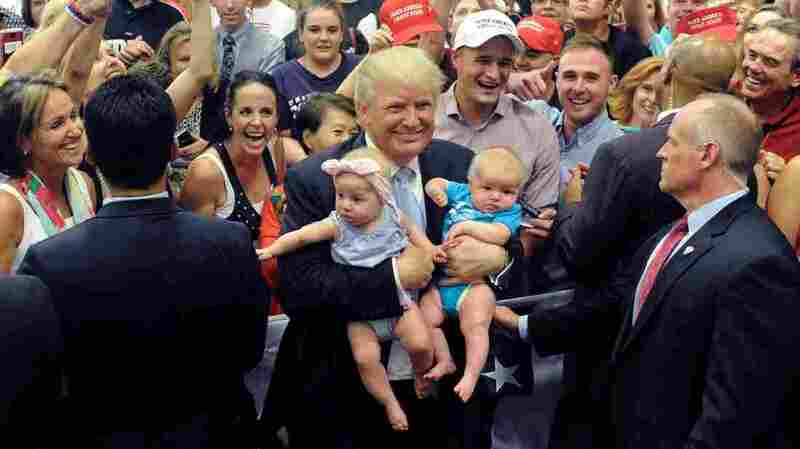 It’s a departure from what Trump proposed on the campaign trail — back then, he called for paid maternity leave. This plan would also cover fathers and new adoptive parents. Parental leave would be mandatory, but not uniform: “States would be required to provide six weeks of parental leave and the proposal gives states broad latitude to design and finance the program,” the administration wrote in its budget. The program would cost around $18.5 billion over 10 years, and according to the budget would be entirely paid for — but that could require some states to raise taxes. Under the plan, the government would set minimum levels for states to maintain in their unemployment trust funds. And if they don’t hit that? “States that are currently below this minimum standard are expected to increase their State UI taxes to build up their trust fund balances,” the budget says. Applying these minimum levels to trust funds would pay for $12.9 billion of the plan, according to the administration. The budget also includes other savings: eliminating improper unemployment insurance payments and implementing programs to get people back to work more quickly could potentially pay for $6.2 billion, which could offset some unemployment insurance taxes. Still, there are a lot of blanks to fill in if this is really to be viable. The Trump administration has said that the details will be worked out in budget negotiations, according to the New York Times, and that states will design their individual programs. Here are a few of the questions that the administration and the states will have to answer if this plan is to move forward. How much leeway will states have? Unemployment insurance is funded by both state and federal payroll taxes, and administered by the states. And while paid parental leave will be a federal mandate, the Trump budget says states will have “broad latitude” to determine what their programs look like. Unemployment insurance itself varies by state, in terms of who is eligible for benefits and how big those benefits are. So given the “broad latitude” here, there’s no way of knowing right now exactly what this program would look like and who would get which benefits (and how much). Some Republicans will balk at the possibility of a new social program. For example, Idaho Republican Rep. Raúl Labrador, a member of the conservative Freedom Caucus, has said he is opposed to the government providing paid leave. Still other Republicans may favor different approaches. And House Speaker Paul Ryan told the New York Times he favored another plan, by Alabama Rep. Martha Roby, who wants employees to be able to save up their overtime pay toward paid leave. And while the plan does call for cutting “improper payments” from the unemployment program — which the budget says could allow some states to cut unemployment taxes — it could also, as we said above, require states to raise unemployment taxes. Those taxes are paid by employers. The potential for raising taxes on employers is something that would definitely give congressional Republicans some pause. Were Trump to push this proposal, he may find some allies across the aisle: Democratic Rep. Carolyn Maloney of New York is one major proponent of paid family leave. Recently, she pushed a proposal to give federal workers six weeks of leave and said she was open to working with the Trump administration on it. Then again, the plan is by no means generous in the context of what many family leave proponents want; it doesn’t provide paid leave for caring for aging family members, for example, and many proponents believe leave should extend beyond six weeks. Still, the fact that paid leave is even a policy consideration is a big deal, says Shabo — even while she maintains that there are major problems with this proposal. Will this be enough money for families? Unemployment insurance isn’t nearly a full replacement for a worker’s wages — that’s simply how it’s designed. Because this plan is based off of the unemployment insurance system, the question is how much this plan would pay out, and whether that would be enough to cushion new parents who take time off from work. In 2016, unemployment insurance replaced around 46 percent of worker pay on average, according to the Labor Department. Given that level, as well as the differences in unemployment insurance by state — the maximum weekly payout is $235 in Mississippi, compared to well over $700 in Massachusetts — and given that “broad latitude” we mentioned, it’s not clear how much families would receive. How does this fit with the rest of the president’s budget? In terms of spending, this is relatively small, at around $18.5 billion over 10 years, and it would be paid for in part by creating savings in the unemployment insurance program. Unanswered is which states could have to raise unemployment insurance payroll taxes, and by how much. In terms of philosophy, there appears to be a disconnect between this program and the budget’s other massive changes. The Trump budget makes major cuts to other social safety net programs. It would cut $616 billion over a decade to Medicaid and $190 billion to SNAP, most notably. But then, family leave has been championed by Ivanka Trump, which likely explains its inclusion among all the other sweeping changes. “They’re going after all these low income programs, and it is a striking contrast that in the end we are actually going to talk about paid leave, which really isn’t the theme of the rest of the budget,” Mathur said. That could mean helping families financially during one stage of life while potentially leaving them hanging during another stage — once that weeks-long parental leave period is over — according to Vicki Shabo, vice president at the National Partnership for Women and Families. “You can’t suggest that working families should have a small parental leave benefit on the one hand and at the same time potentially take health insurance away from them and their families,” she said, referring to the big Medicaid cuts in the budget. One day after a bombing claimed at least 22 lives at a concert venue in Manchester, England, Prime Minister Theresa May has announced the U.K. is raising its terror threat level. The move declared Tuesday evening means members of the British military will be deployed throughout the country to supplement its police forces. The announcement comes just hours after police identified a suspect — 22-year-old Salman Abedi — and ISIS claimed responsibility for the bombing, which also wounded dozens of concertgoers. Greater Manchester Police also announced Tuesday that they had “arrested a 23-year-old man” in connection with Monday’s bombing. The BBC reports this is only the third time the U.K. has reached the highest terror threat level under its alert system — and the first since 2007. NPR’s Bill Chappell has more on the Manchester attack — everything that we know, as of Tuesday evening — right here. 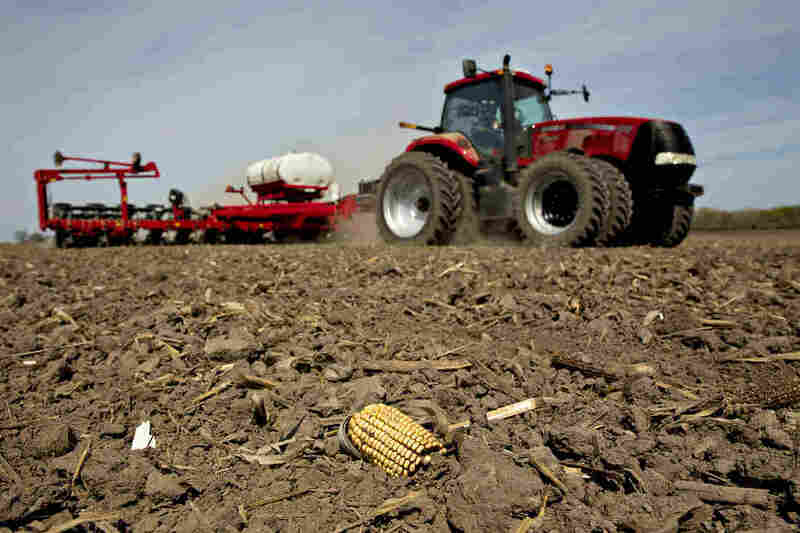 A tractor pulls a planter through a field as corn is planted in Princeton, Ill. The broad outlines of this budget, with its 20 percent cut in the USDA’s discretionary spending, had been released two months ago. This week, it became clear exactly what the Trump administration wants to cut: agricultural research, food aid for the poor, and programs that benefit small rural communities. The budget also includes a surprise that’s particularly unwelcome to big Midwestern farmers. It proposes new restrictions on government-subsidized crop insurance, a program that is particular favorite of grain farmers. The changes, which would require congressional approval, would limit the ability of large farmers to take advantage of those programs and cut government subsidies by more than $2.5 billion each year. In a statement, the American Farm Bureau Federation said that “this budget fails agriculture and rural America.” Similar criticism came from the American Soybean Association and the National Corn Growers Association. The impact of those cuts, however, is dwarfed by proposed restrictions on the SNAP program, which helps the poor buy food. Those changes would cut SNAP spending by $4.6 billion in 2018, increasing to more than $20 billion annually by 2022. The budget reduces funding for the Agricultural Research Service by $360 million, or 26 percent. This would mean closing the doors at 17 research centers. It also completely eliminates the country’s flagship program of international food aid, called Food For Peace. The current USDA budget includes $1.7 billion for that program. All of this, of course, is merely a proposal for Congress to consider, and by all indications, Congress is inclined to reject much of it. The Republican chairmen of the agricultural committees in both the Senate and the House released a muted joint statement that said nothing at all about the proposal itself, but promised to “fight to ensure farmers have a strong safety net.” They also pledged “to take a look at our nutrition assistance programs to ensure that they are helping the most vulnerable in our society” — a signal that they hope to revive the rural-urban coalition in Congress that has traditionally defended a package of food aid and farm subsidies. Philippine President Rodrigo Duterte reviews guards just outside Moscow late Monday. 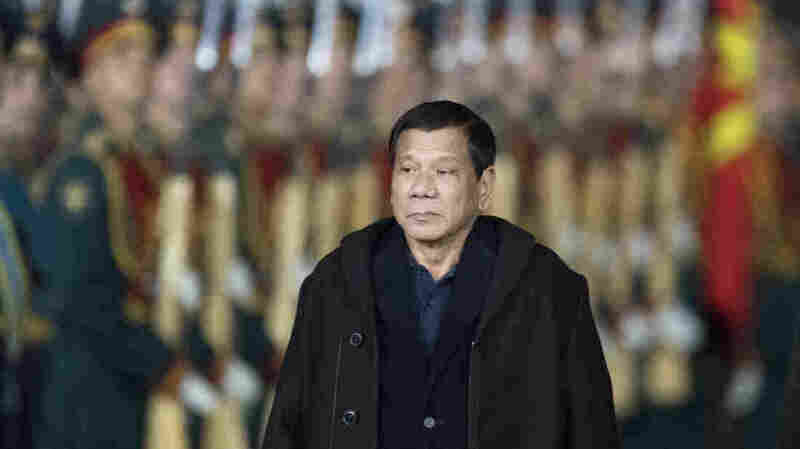 He announced Tuesday night he would be cutting his Russia visit short due to violence on Mindanao, where he declared martial law. Many years have passed since Fannie Mae and Freddie Mac got into financial trouble and had to be placed in conservatorship. The mortgage giants are stable now, but nine years later there is still the question of how to get these companies out of conservatorship and on their own again. NPR’s Ari Shapiro talks with Nick Rasmussen, director of the U.S. Counterterrorism Center, about the Manchester attack and the state of intelligence gathering and sharing with the United Kingdom and other allies.